The party has produced a 15-page guide for canvassers ahead of the general election campaign. FINE GAEL CANVASSERS are being advised to warn voters that it’s “the same old Fianna Fáil”, that Sinn Féin is a “high tax, anti-jobs” party and that Renua has “no substance”. A 15-page canvass guide has been produced by the party in advance of the general election with thousands of party members expected to hit the doorsteps seeking votes for Fine Gael candidates in the coming weeks. The guide has two full pages of speaking points on the opposition parties with canvassers told to inform voters that independents will be a “recipe for chaos and crisis” and that the Social Democrats would “hike your taxes”. 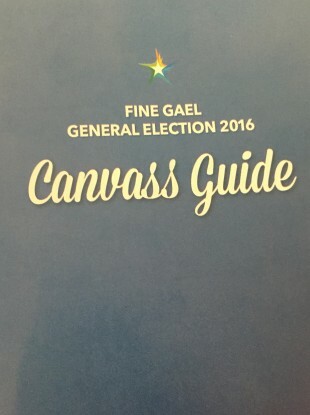 The canvass guide is being distributed to members attending the Fine Gael Ard Fheis in Citywest this weekend. The guide also has notes on why people should vote for Fine Gael with bullet points outlining the government’s progress on employment and investment. It lists key statistics, including the rate of economic growth, the cuts in Universal Social Charge, the fall in unemployment, the reduction in public sector numbers by 10% and the recruitment of more guards and nurses. There is a guide to preparing for a canvass with a checklist that includes ensuring canvassers have a biro, comfortable shoes and that they “dress smartly, but comfortably”. Canvassing is about effective communication with the electorate to secure their support. Canvassers are at the frontline in the struggle to secure votes. Your efforts are vital. The more effectively we canvass, the better the result. There is also a list of Dos and Don’ts when canvassing. These including ensuring that you close gates behind you, that you don’t “take shortcuts over walls or hedges”, and that you make sure you “don’t waffle”. “Don’t pick times when people are most likely not to be at home, or receptive (during televised sports events, blockbuster episodes of TV soap operas),” the guide states. Canvassers are also warned to be wary of “spoilers” – supporters of other parties who may try and hold you on the doorstep. The guide states that canvassers should also keep a note of those who require transport to the polling station on election day. Email “Revealed: The Fine Gael guide to canvassing and how to lash the other parties ”. Feedback on “Revealed: The Fine Gael guide to canvassing and how to lash the other parties ”.